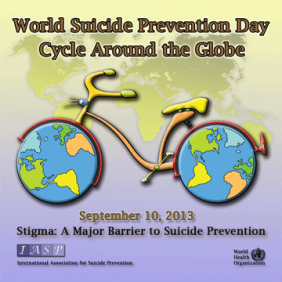 This year, the International Association for Suicide Prevention (IASP) has planned a core activity for World Suicide Prevention Day, called "Cycle Around the Globe." An editorial of The Lancet focuses on the report by the House of Commons Health Committee assessing the Mental Health Act 2007 for England and Wales. A video infographic published in The Lancet presents the findings of a new analysis from the Global Burden of Disease Study 2010 (GBD 2010), which highlights how mental and substance use disorders were the leading cause of non-fatal illness worldwide in 2010. The Happy Days Project aims to promote mental health, positive environment and happiness in schools, school communities, students and teachers. 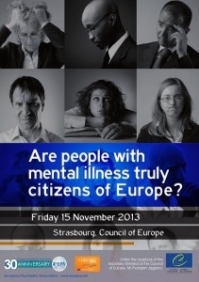 As part of its 30th Anniversary celebrations in 2013, the EPA decided to dedicate a special 30th Anniversary Symposium to the topic “Are people with mental illness truly citizens of Europe?”.